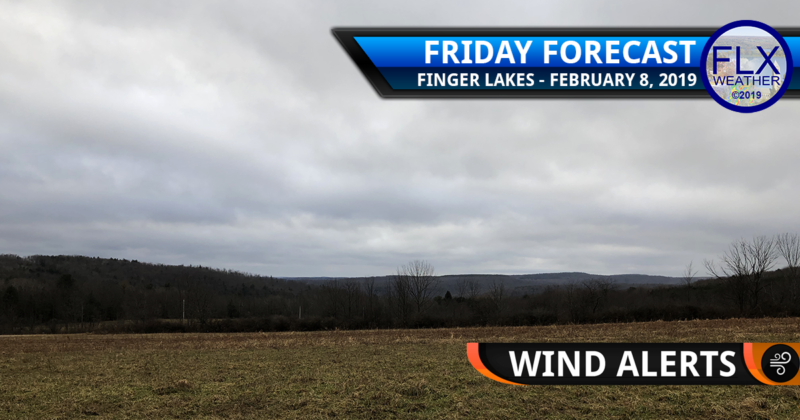 A cold front moved through the Finger Lakes before dawn this morning. Behind this front, temperatures will steadily fall throughout the day thanks to strong west-southwest winds. After starting in the 40s and even 50s, temperatures at 7am are already falling into the 30s for western parts of the region. The 30s will quickly overtake the entire area this morning. This afternoon, temperatures will continue to tumble and should drop into the 20s before the sun is even down. Skies will remain cloudy, but precipitation will be limited to a few stray flurries, especially along the Thruway as some snow develops off Lake Erie. The biggest story will be the wind today. The further north and west you go, the stronger the winds will be today. Gusts over 50 mph are possible between Rochester and Buffalo where High Wind Warnings are in effect. Most of the remainder of the Finger Lakes is under a Wind Advisory with gusts over 40 mph. Schuyler, Chemung, Tompkins, Tioga, and Cortland counties are not under any wind alerts, but it will still be blustery today with 35-45 mph wind gusts. The wind will continue to be strong into the overnight, with 40-45 mph wind gusts throughout the region. The wind will very slowly let up over the course of Saturday as it turns to the northwest. Expect 30-40 mph wind gusts to continue into the afternoon. With the turn in the wind to the northwest, a little lake effect snow from Lake Ontario will enter the northern and eastern Finger Lakes. An inch or two could fall in far northeastern Wayne, northern Cayuga, and northern Onondaga counties. A coating to an inch will be possible further south through about Ithaca and Cortland. The lake effect will dissipate during the midday hours and the sun will come out regionwide for the afternoon. Temperatures will reach a high in the mid 20s, but the wind chill will hover around 10 degrees throughout the day. As the sun sets Saturday, winds should quickly drop and become nearly calm overnight. Sunday and Monday will be quiet days across the Finger Lakes. Both days should be rather cloudy and a stray flurry or two may be possible Monday morning. Temperatures will start Sunday in the mid teens and rise to about 30 degrees. Monday will start in the low 20s and reach the low 30s. The next storm system will then take aim at the Finger Lakes on Tuesday. Precipitation should work from southwest to northeast sometime during the morning. Temperatures aloft will warm to near or above freezing while surface temperatures should remain below freezing. Some sort of wintry mix of precipitation types will probably result. The details, of course, are still very up in the air though. Those with travel interests on Tuesday should monitor the forecast as it becomes more clear over the coming days. The low pressure system will track northeast through the Great Lakes, likely resulting in another period of blustery to strong winds that will linger into Wednesday. Temperatures should stay near normal before and after this system with highs mostly in the 30s next week. Finger Lakes Weather has a small number of openings for new clients to take advantage of FLX Weather’s Professional Services. This is a tremendous opportunity that rarely opens for private forecasting, consulting and/or weather media creation. Rather than rely on generic, region based forecasts, you get exactly the information you need, exactly when you need it, and for your exact location. This is great for summer camps, golf courses, plowing companies, school districts, DOTs, agriculture, or any other business impacted by the weather. Local media sources looking to invest in their weather reporting should look no further. I’ve worked with a number of local media sources, including FingerLakes1 and NYUP.com to produce high quality, locally focused weather content. Having an actual meteorologist working on your weather forecasts and stories will increase reader engagement and trust, and the forecasts you display will be much more accurate. Imagine the same level of high quality, accurate content you have grown accustom to on FLXweather.com, but on your platform and with your branding! Again, since I run Finger Lakes Weather by myself, I limit the number of clients I work with so I can give each client the attention they need and deserve. If you are interested in my Professional Services, do not hesitate to get in touch to learn more! The opportunities are limited, but the benefits tremendous. Don’t wait! Fill out the form for an obligation free information request and quote. Hi Drew, I need to drive to Rochester on Weds, Feb 13 and will need to leave Ithaca ca. 8 am. As I age, I’ve become such a chicken in winter. Probably too soon to tell but what are your thoughts abt weather on that date. Thanks Melanie W.
Could be some lake effect around, but yeah…it is too early to be certain of much of anything.